The United Nations’ (UN) World Television Day was created by a resolution in 1996 and is annually observed on November 21st in many places around the world recognizing that television plays a major role in presenting different issues that affect people. From the United Nations website: "World Television Day is not so much a celebration of the tool, but rather the philosophy which it represents. Television represents a symbol for communication and globalization in the contemporary world." That's all well and good and I admit that my life has been enriched by news, current affairs programs and documentaries available to me on television. However, I am also a North American baby boomer and it is a wonder that my generation has not evolved into a creature with one square eye in the middle of our foreheads considering the overwhelming presence of television in our lives. My celebration of World Television Day is a look at a baker's dozen of my favourite television themes. It was tough limiting the list, because there are plenty more where these came from. It is music that instantly recalls my telelvision friends and the real life people who shared the laughter, the tears and the discussion around our viewing. This is music that, although inextricably wound up in the fictions they represent, still stand on its own. Many became radio hits. I understand in more recent history it is radio hits that become theme songs, if there is a theme song at all. This is an entertainment evolution that makes no sense at all to me. Fred Steiner's Park Avenue Beat grabs you and doesn't let go. Jerome Moross' lovely, stirring theme used from the 3rd season on. Melody first heard in 1959s The Jayhawkers! The team of Jay Livingston and Ray Evans (Silver Bells, Mona Lisa, Que Sera Sera) gave us this joyous, iconic theme. Quincy Jones and one of my favourite shows of the 60s/70s. A perfect combination. Maybe you like one of Lalo Schifrin's other themes better, but I'm a Mannix gal from way back. I defy anyone to keep still while listening to Morton Stevens evocative theme. If your life had a theme song wouldn't you have wanted it to be composed by Jerry Goldsmith? Elmer Bernstein being cheeky and cool. It would be too easy to have posted a list of favourite Mike Post themes. Dave Grusin's theme is irresistible. Anne Dudley perfectly captures the era and the whimsey. The amusing and memorable song with lyrics by show's creator (and certified genius) Nat Hiken and music by Grammy and Emmy winner John Strauss. I know you're aching to share your favourite TV themes. My apologies in advance for pushing you into the time sucking vortex of YouTube, but you know you love it! I'll take HILL STREET BLUES, HAWAII 5-0 and BONANZA (my father's favorite Western TV show) and add the themes to HAPPY DAYS, LAVERNE & SHIRLEY, DIFF'RENT STROKES, THE JEFFERSONS, THE FACTS OF LIFE, GOOD TIMES and, of course, STAR TREK TNG (there's your Goldsmith connection). What's your view of TV shows as singular, serialized stories as opposed to episodic fare? I understand the appeal - I remember the first time I saw 24 and how quickly and easily I got caught up in it - but I wish there were more of a balance between serialization and 'done-in-one' episodes. When I was a kid, the words "to be continued" at the end of an episode felt like a cheat. In all likelihood you would be tuning in next week, but the idea that you "had to" was too controlling. In my viewing history, "Hill Street Blues" was the first series that had a continuing arc, but they also had completely satisfying plots that were contained in one episode. I suppose it is the difference between do I want to settle in with an involving novel, or am I in the mood for a well-crafted short story. Gavin likes to listen to the "Happy Days" theme on YouTube. He doesn't know from the show, but he likes that peppy song. More Goldsmith: I never fast-forward through "Voyager". Happy World Television Day! This is splendid. Peter Gunn and Perry Mason were my favorites, but then I was always a sucker for cool jazz. Also liked Hawaii-5-0, but any theme song with lyrics was bound to be remembered forever. Fun. Those themes practically define "cool". The sing-along scene in "Planes, Trains and Automobiles" is a tribute to how much the theme songs get to us. Everyone knew "The Flintstones"! When I was a kid I never missed the opening to the "Spider-Man" cartoon show. Loved that theme. Never could get into the show, but loved that song. I agree, "Spider-Man" song tops, but I never really followed the show. Just openings and closings. One of the all-time great TV themes. Also enjoyed your oh, so entertaining test pattern. How well I remember the days studying it as a child. 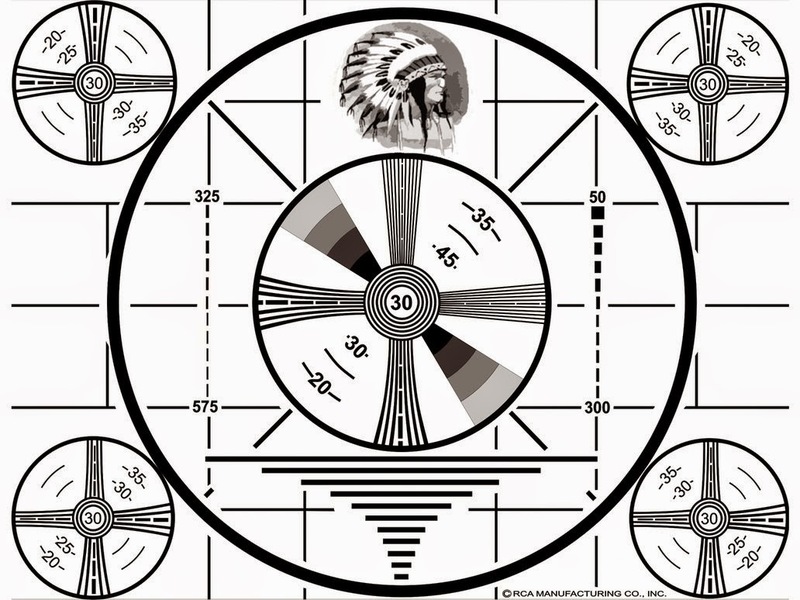 The test pattern, so mysterious yet promising so much when the broadcast day began. That's entertainment! What a great way to celebrate World Television Day! Love your choices, especially PETER GUNN, PERRY MASON, ST. ELSEWHERE, and, of course, HAWAII FIVE-O. My own list would also include ROUTE 66, MISSION: IMPOSSIBLE, MAN IN A SUITCASE, and THE AVENGERS. Dandy choices, Rick. A couple of hours after I posted this, Nelson Riddle's "Route 66" popped into my head which I promptly hung in shame. "The Avengers" is so snazzy! HAWAII FIVE-O is probably my favorite, but there are so many. I also love THE UNTOUCHABLES. Another winner from Mr. Riddle, if memory serves. I would probably watch more contemporary TV shows if they had themes. A lost and missed art form, at least by some of us. Our friend Mr. Riddle makes another appearance. "The Untouchables" is so cool. Cool, and a little bit scary when I was a kid. Something is missing when a show doesn't have a theme song. It feels incomplete - naked. Music creates a connection. I'm a big fan of the Jeeves and Wooster theme song. A few years back, my husband and I borrowed all the episodes from the library during an especially rainy spring. What a treat that series is! We borrowed it from the library as well. We wanted to show our daughter (10 at the time). The accents were incomprehensible to her and she ran screaming from the room! She's better now. In her 20s a real Wodehouse nut who has converted her friends.